You think chicken breasts are delicate? Salmon has it beat by a mile. With practice, you can get to the point of nailing a perfect medium-rare center on a piece of poached or pan-seared salmon. But practicing on salmon can get pricey, and sous vide guarantees perfectly moist, tender results each time. Sous vide also allows you to achieve textures you never knew were possible, from buttery-soft to meltingly tender and flaky-yet-moist. J. Kenji López-Alt is the Managing Culinary Director of Serious Eats, author of the James Beard Award-nominated column The Food Lab, and a columnist for Cooking Light. He lives in San Francisco. A New York native, Kenji cut his cooking chops the old-fashioned way by working his way up through the ranks of some of Boston's finest restaurants. With an education in science and engineering and as a former Senior Editor at Cook's Illustrated and America's Test Kitchen, Kenji is fascinated by the ways in which understanding the science of every day cooking can help improve even simple foods. He earned a James Beard award for his first book, The Food Lab: Better Home Cooking Through Science, which he released in September 2016. It is available for purchase from Amazon and Barnes & Noble. Gently run your fingers across the surface of the fish to find a ridge of thin, flexible bones protruding from the flesh. Use a sturdy pair of needle-nose pliers, or if you have them, some sturdy fish tweezers to pull the bones out. Grasp the very tips, then pull them out by pulling along their length to minimize damage to the surrounding flesh. Make sure you also get any bones that are protruding from the cut faces along the sides of the slice. Using a sharp knife and steady, long strokes, slice through the salmon, making sure to cut through the skin as well. Divide each of those halves into even 5- to 6-ounce portions. The resulting pieces are closer to square in shape than the long skinny rectangles you'd get by portioning without splitting. Season the salmon on all sides generously with salt. You can also season with white or black pepper at this point. Place the salmon portions in a single layer inside one ore more zipper-lock bags. Add a couple teaspoons of olive oil per filet to each bag, turning the salmon and using your hands to make sure that it's coated on all sides to prevent sticking. Add some gently aromatics like fresh herbs such as thyme, parsley, or dill, thinly sliced shallots, or grated citrus zest. Do not add large chunks of food which can damage the shape of the fish, or acidic ingredients which damage the texture. Once bagged, seal the bag let the salmon rest in the refrigerator for at least 30 minutes and up to overnight for the salt to firm up the flesh. Set the temperature on your sous vide cooker according to the chart and allow it to preheat while the salmon rests. 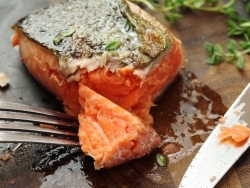 Remove all the air from the bag using a vacuum sealer or the water displacement method, then add the salmon to the preheated water bath and cook for 30 to 45 minutes for one-inch filets, or 45 minutes to an hour for filets up to two inches thick. Carefully remove the salmon from the bag using your hands or a fish spatula and keeping it supported at all times to prevent it from breaking. Place it on a double layer of paper towels, then use another paper towel to gently blot the surface dry. Discard the aromatics at this point. If you'd like, you can remove the skin at this point as well. It should peel right off. You can serve the salmon immediately as-is, chill it and serve it cold, or for a more classic presentation, sear it briefly before serving. To sear, heat up a thin layer of oil in a cast iron, carbon steel, or non-stick skillet over medium-high heat until shimmering. Add salmon skin side down, gently pressing on it with a fish spatula so it makes good contact with the pan. Sear until the skin is browned and crisp, about a 1 1/2 minutes. Flip the salmon and briefly kiss the second side with the pan to give it a touch of color. Transfer to paper towels to blot off excess oil, then serve immediately.